The mission of the National Institutes of Health (NIH) is to seek fundamental knowledge that will enhance health, lengthen lifespan, and reduce illness and disability. Yearly, Congress provides funding so that NIH can help meet this mission and its goals of supporting creative discoveries and innovative research. While innovation and significance are core to the NIH review process, researchers must instill a high degree of confidence that they have the training, experience, methodology, and supportive institutional environment to be successful in their research endeavors. On Thursday, November 3, Dr. Norman Braveman, Miami alumnus, former senior member of the NIH extramural program, and current current President of Braveman BioMed Consultants, shared with faculty in Miami University’s Department of Psychology the importance of understanding the NIH review process for successful grantsmanship. Not only should a grant proposer understand the review process, they should also understand the mission of the NIH and most importantly of the institute or center (IC) to which they are applying. Braveman suggested going to the IC website to get a snapshot of the IC strategic plan prior to formulating project objectives so as to focus your research on areas of current importance to the mission of the IC. Braveman began by providing a 50,000-foot overview of the NIH grant review process. Most applications are assigned to the Center for Scientific Review (CSR), where they undergo initial scientific merit review. Some applications may undergo initial peer review in a specific IC, as specified in the funding opportunity announcement (FOA). Understanding where your proposal will be reviewed (CSR or IC) and by whom (e.g., scientific review group) can help you target your application accordingly. 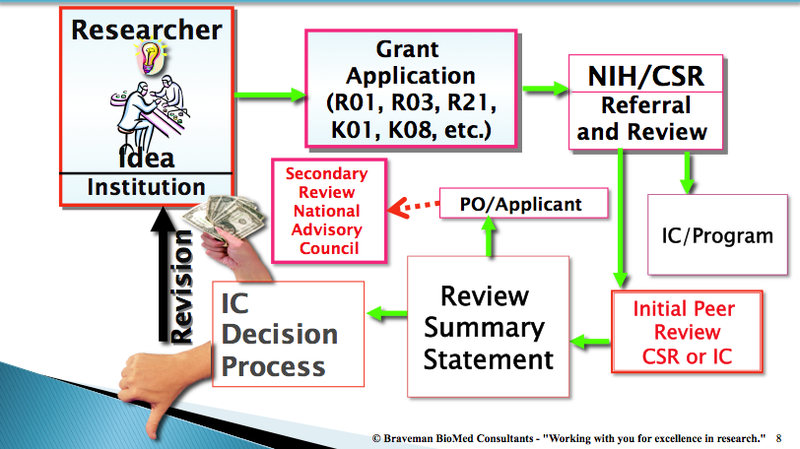 This flow chart from Dr. Braveman’s presentation shows how the NIH review process works. While NIH review criteria include significance, investigator(s), innovation, approach, and environment, Braveman suggested that the un-scored “Specific Aims” section is the most important part of any NIH grant. It is in this section that researchers tell the reviewers about the purpose and importance of their project. The specific aims may determine whether a reviewer wants to read more or set the proposal aside — which equates to getting triaged or not discussed and/or scored. If the specific aims are clear, concise, and attention-grabbing, then the proposal may be discussed by the study section. It is important to note that any proposal that has been triaged can be pulled into the discussion by any of the reviewers serving on the study section. Proposals that are discussed receive a score from 1- 9, with 1 being “exceptional” and 9 being “poor.” Average scores are multiplied by 10, then scores from all proposals from that review round are percentile-ranked. 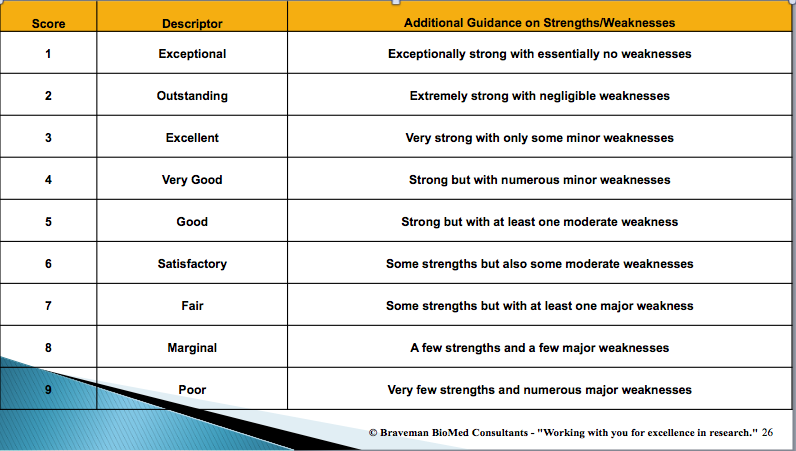 This table from Dr. Braveman’s presentation describes the NIH review scoring system. Once proposals are scored and ranked, they go to the National Advisory Council for second-level review. This council reviews the nature of the proposals submitted to see how they fit into the objectives of the NIH and into the objectives of the current IC. Considerations such as how project ideas may work synergistically to answer larger questions are taken into account in making funding decisions. Therefore, it may be the case that one proposal that doesn’t score as well as another may get funded because it addresses a question that no other proposal addresses and is currently important to the mission of the IC. Remember that when writing an NIH — or any — grant proposal, as Francis Bacon said, “knowledge is power.” Be certain to do your homework and understand the funding agency, as well as the review criteria and review process to increase your chances of funding success. Written by Tricia Callahan, Director, Office for the Advancement of Research and Scholarship, Miami University. Microscope image by the National Cancer Institute, via Wikimedia Commons, used under public domain. YES!/NO? illustration by I and Materia via Wikimedia Commons, used under Creative Commons license. Flow chart and table illustrations by Dr. Norm Braveman, used with permission. This entry was posted in Grantwriting and tagged grant review, NIH, proposal review, scientific review, scoring. Bookmark the permalink. Understanding your audience and its concerns is the key to any good writing. In grant writing, understanding the concerns of peer reviewers and the peer review process can demonstrably improve your writing and the efficiency of your writing process. Here I reblog a post regarding a presentation on this topic by Dr. Norm Braveman, formerly of the NIH, from the Miami University Office for the Advancement of Research and Scholarship.